The M18 FUEL ONE-KEY 18-Volt Lithium-Ion Brushless Cordless Combo kit includes the M18 FUEL Hammer Drill and the M18 FUEL 1/4 in. Hex Impact Driver for maximum performance on your toughest drilling and driving projects. The hammer drill delivers 1200 in. lbs. of peak torque and up to 2000 RPM, providing faster drilling speed under heavy load, while the impact driver offers maximum efficiency at 1800 in. lbs. of fastening torque. M18 FUEL offers super advanced cordless technology: a POWERSTATE Brushless Motor, REDLINK PLUS electronic intelligence and REDLITHIUM battery technology, resulting in longer motor life, more run time and more power. Both tools are ONE-KEY enabled, allowing users to wirelessly connect to the tool with a smartphone for unlimited customization and control. The ONE-KEY application features predetermined set-ups for specific fasteners and materials or provides complete control over output speed and power to customize the tool for the application at hand. Once the desired output performance is reached, the custom profile is saved to the tool's memory and the connection to the smartphone is no longer necessary. Each tool's memory supports up to four custom profiles that can be easily accessed with the touch of a button. 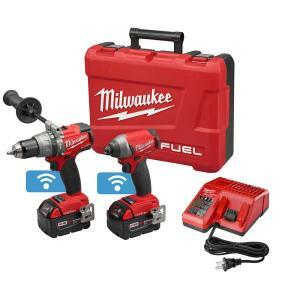 Tbook.com crawls the web to find the best prices and availability on Hammer Drills and related Tools and Hardware products like Milwaukee M18 FUEL ONE-KEY 18-Volt Lithium-Ion Brushless Cordless Hammer Drill/Impact Driver Combo Kit w/(2).... For this page, related items include products we find that match the following keywords: "Hammer Drill" at our vendor partner Home Depot. Milwaukee M18 FUEL ONE-KEY 18-Volt Lithium-Ion Brushless Cordless Hammer Drill/Impact Driver Combo Kit w/(2)... is one of 148 Hammer Drills and related products listed in the Tools and Hardware section of Tbook.com If you have any questions on this product, please give us a call at 734-971-1210 during the hours of 9am - 5pm EST for assistance. Thank you for shopping at Tbook.com, the Internet Department Store!